This light lavender cufflink set features an elegant high quality polished silver body and a fabric covering. The silver and lavender color looks best in combination with shirts in light blue, white, gray, and purple. 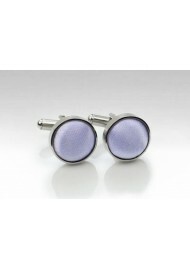 This lavender color also comes as matching ties and pocket squares.